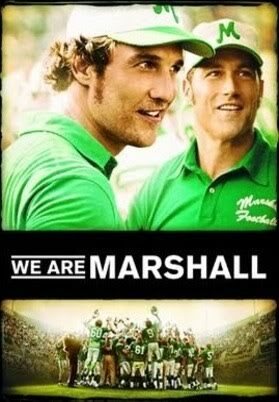 We Are Marshall (2006) is an amazing movie. In 1970, a plane carrying the university’s football team, athletic staff and assorted other members of the community crashed just outside of town, on a return trip from an out-of-state game. All 75 people on board died. I think this remains the deadliest sports tragedy in American history. We Are Marshall is about the community grieving this loss and coming together to form a new team. Even though it’s a “football movie”, it is so much more. The film was so well done. I’ve seen it at least a half a dozen times, and I still get goosebumps every time that plane goes down. And teary-eyed throughout. The loss the entire Marshall/Huntington community must have been feeling is unimaginable but you get a sense of it. This movie is endearing and uplifting, something I can watch over and over. You can feel the power and emotion behind the story. I certainly believe that the actor and producers creating it really cared about the people involved. It stars Matthew McConaughey, Matthew Fox and Kate Mara (who is my favourite actress). Here is the trailer.